GENASYS Matrix Switch Interface Module | Marvin Test Solutions, Inc.
A component of the GENASYS switching subsystem, the GX6032 switch card is one of several different switch cards which can be installed in the GX7016 and GX7017 chassis to provide access to the chassis' internal, 16-wire bus. The GENASYS switching subsystem offers a new level of high performance, high density switching for board and system level functional test. 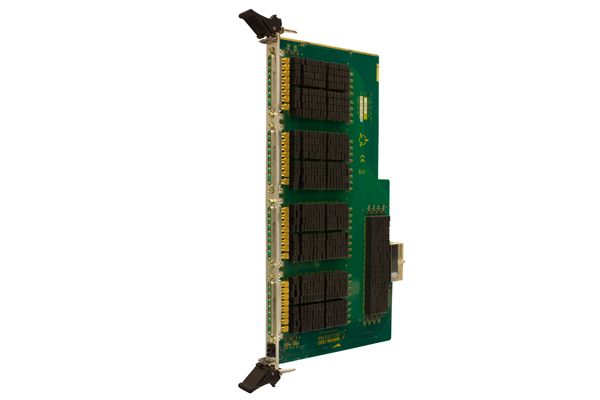 Based on the 6U PXI architecture, the GX7016 and Gx7017 chassis incorporate a modular switch matrix and multiplexer architecture which supports up to 4608 or 2304 multiplexed, hybrid I/O pins respectively. The GX7016 supports up to 128 external resources and the GX7017 supports up to 64 external resources, which can be connected to any of the test system’s receiver I/O pins via a high performance, internal 16 wire matrix bus. The GX6032 provides access to external analog instrumentation which can be routed to the internal 16-wire analog bus via the module's 32 x 16 matrix. This module is installed in the rear of the GENASYS chassis. Up to 4 GX6032 cards can be installed in a GX7016 chassis. Two cards can be accommodated in a GX7017 chassis. Control of the Gx6032 is provided via Marvin Test Solutions’ SwitchEasy which provides overall control and management of signal routing within the system. SwitchEasy provides end to end signal routing by having the user simply define the resource and receiver pin or UUT connections, simplifying overall application development and deployment time.